CLICK for more photos from Kappa in Kyushu.
. - Tanushimaru 田主丸 - Fukuoka 福岡県 - .
. Chikugo no kuni 筑後国 Chikugo Province .
. - Kappa Jizoo かっぱ地蔵 Kappa and Jizo Bosatsu - . Yamano no Gaku 山野の楽 "Ritual Music from Yamano"
Yamano no Gaku is a festival which is held every year on September 23 at Yamano Wakahachiman Shrine. Emperor Ojin was deified as Hachiman-jin (the tutelary god of warriors), and is said to be enshrined in all the sites dedicated to him. 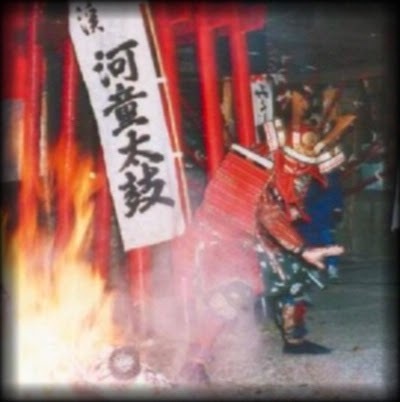 In the year 1244 (Kangen 2), in order to share the tutelary deity of the 宇佐八幡宮 Usahachiman Shrine in Oita Prefecture, the tutelary god of warriors was also enshrined in the Yamano Wakahachiman Shrine. This is the beginning of the Yamano no Gaku Festival. During this festival, which has a history of more than 750 years, the shrine parishioners pray for the well-being of their families as well as a bumper harvest. Visitors to this festival will also be able to see the Gaku Uchi. 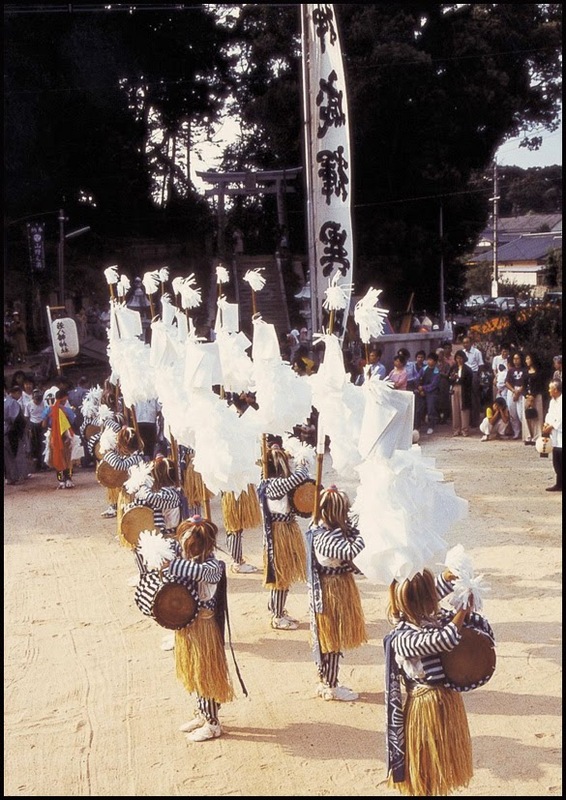 The Gaku Uchi is a drum dance performed in order to ward off disasters. There are 2 versions of the Gaku Uchi. The Fue Gaku is a performance with flutes in order to pray to the repose of souls. The Uta Gaku is a traditional Japanese prayer song. The performers of the dance are referred to as Gaku Kata. The costumes of the Gaku Kata make the performers look like Kappa, a mythical water-dwelling creature. Hence, this festival is also known as the Kappa Festival.
. Garappa ガラッパ Garappa Don ガラッパドン .
. Gataro ガタロ Kappa and the Gion crest 祇園さん . Once upon a time there lives a huge serpent in the pond near the mountain. She came down to the village to get a girl age 18 every year. But the villagers finally talked her into accepting 18 mochi 餅 rice cakes instead, which they threw into the pond. This is the origin of offering mochi in the local Shinto shrine, they say. 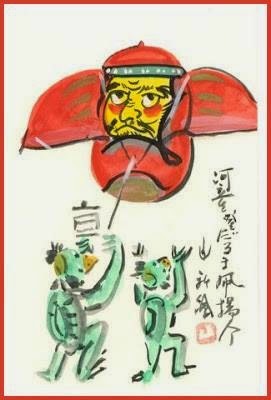 Other versions say it was a Kappa in the pond.
. Hidari Jingoro 左甚五郎 master carpenter . 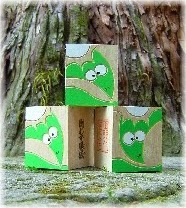 - and the origin of Kappa eating shirikodama.
. yama no mono ヤマンモン，kawa n hito カワンヒト 河童 Kappa .
. The Kappa from 龍ヶ淵 Dragon Riverside .
. kane 鉄漿 black color for teeth, Ohaguro .
. Kappa Legends from Miyazaki 河童伝説　- 宮崎県 .
. Gaappa ガーッパ The Kappa of Nagasaki 長崎県 - Legends .
. Gaappa ガーッパ Kappa and Sake .
. Kappa Jizoo かっぱ地蔵 / 河童地蔵 Kappa and Jizo Bosatsu in Nagasaki .
. Fishing for Abalone in Fukue 福江市とあわび　.
. donku ishi どんく石 Kappa Stone and more . In former times Kappa were believed to bring harm to the crops of the fields near the river. So in Summer cucumbers and aubergines, prefered food of the Kappa, were consecrated at the local shrine and then floated in the river with the prayer to protect the crops. People who were bewitched by the Kappa and had lost their good sense had to sleep in a room with a window toward the river and not use the exit on the road where a Kappa might walk along. When emptying a bucket of water outside, you had to make a loud call to the Kappa first and ask for his permisison. Women had to behave near the river, lest the Kappa might want to seduce them. Women and girls were also not permitted to go to the river at night and expose their body in the water, because they could get pregnant that way and give birth to a Kappa Baby. in the village of 日田郡竹田村 Hita Takeda there lived a 12 year old boy named Shokichi. His father was a strong sumo wrestler and Shokichi, still a child, was practicing hard too. Then one day Shokichi was swimming in the nearby river when someone began to play sumo tricks on him. Shokichi dove down into the water and got hold of something, giving it a good punishment and then went home. In that night when all were asleep, Shokichi woke up and felt the urge to take a bath. So he went to the river. And surprize - many children came out of the river and challenged him for a bout of sumo wrestling. Shokichi soon realized that this were the local Kappa and begun to wrestle with them. Soon he had won against two of them. But then more than ten begun to attack him at once. and Shokichi, eager to win, wrestled with all his might. Back home his father woke up and realized that his son was gone, so he went to the river too. He saw Shokichi on the river bank moving back and forth in a strange manner, as if he was crazy. So his father carried him home by force. From that time on Shokichi had lost all his good senses and seemed only to wrestle with invisible adversaries. 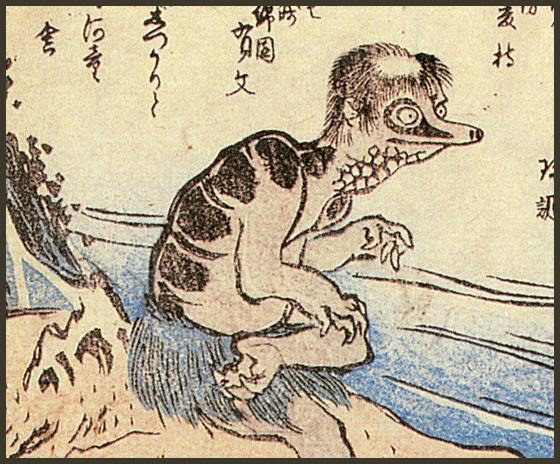 His father realized that he was bewitched and possesed by a Kappa. 郷義弘 Go no Yoshihiro beside the boy. Shokichi begun to tremble and hid under the bed covers. When they tried to sharpen the sword, Shokichi begun to run wild again. In the end they called a special mountain priest 修験者 to do some exorcism and the boy was finally healed. Kappa are seen often, from the river entry into the see up to the mountains. But most often between 宮野浦 Miyanoura and 色利浦 Irori-ura. 橋の欄干 the railing of a bridge. Be careful of a Kappa when drunk, you might be swindled out of something. 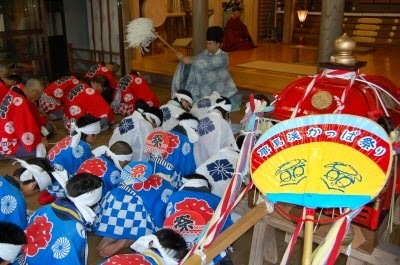 also called Kappa Matsuri 河童まつり. With Kappa in the middle people walk around him with great hand fans 唐団扇 and fan him to appease the wild soul of the Kappa. After that through the 神通力 super-naural power of the Kappa the village will live in peace for another year. This festival dated back at least to the middle of the Edo period and is now the main summer festival of the shrine. 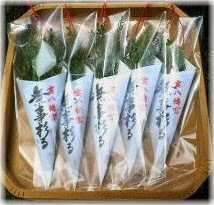 Chikugo is the origin of this kind of Kappa Gaku, which is now an important intangible folk culture asset in Oita 大分県無形民俗文化財. located at Yabakei Town in Nakatsu City, Oita Pref. enshrines Kumo no Yahata no Okami and Myoken Okami. In the precinct stand a huge cedar tree, which is called “sennen Sugi (The 1000-year-old cedar). 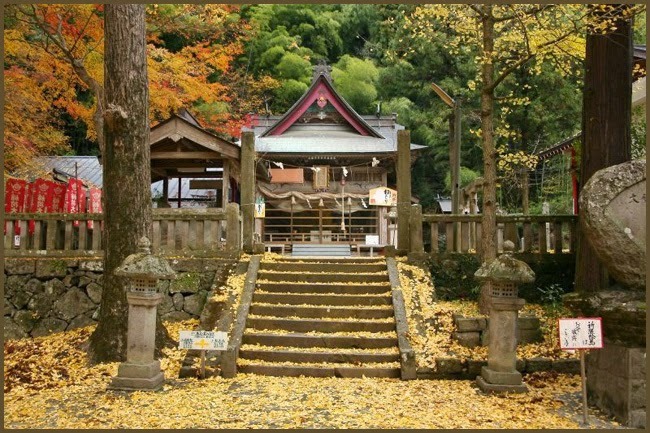 The origin of the shrine dates back to the 3rd century, when legendary Empress Jingu, who was on her way back from the Korean invasion, took a rest on a huge stone at the foot of a mountain. Since then miraculous events including a white cloud rising up out of it had happened around this stone. In 703, a lot more clouds suddenly rose up from the stone and the light like arrows of lightening flashed and it took the shape of a small child-like god, which then disappeared. Having the feeling of awe at this miracle, the village people built a small purple shrine beside the stone and worshipped it respectfully. This is the origin of Kumohachiman Shrine and the Kumoishi Stone. The main building was relocated to the present place by Masataka Kiyohara (the lord of the province) later in 983. The shrine is famous for “Kappa Festival,” or formally named “Miyazonogaku, Miyazono Gaku 宮園楽 ,” in which traditional music is played to dedicate to the gods. 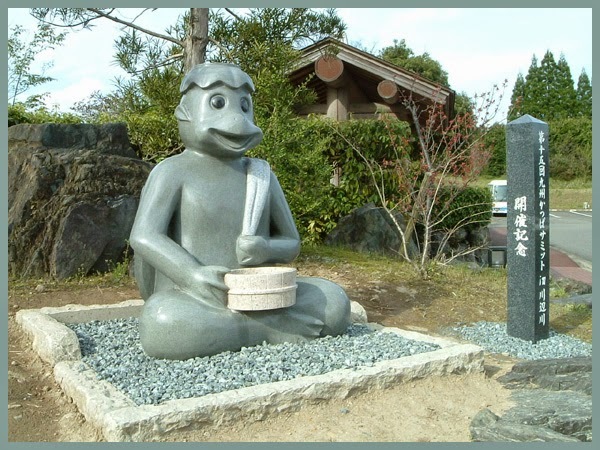 The legend has it that Heike refugees, who had been defeated in the battle with Genji clan, transformed into a Kappa and brought harm to people, so the villagers began to play music to appease their spirits. Before the festival, ritual cleansing. The great fans with the Kappa face are on the right. 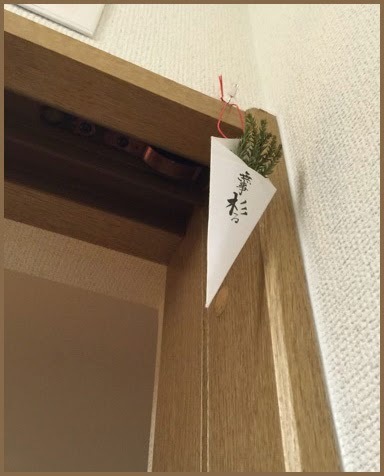 an amulet to win against the misfortunes of life, another pun with the kanji characters 勝破. This is a three-dimensional amulet. Also sold at other shrines in Japan, for example the 廣田神社 Hirota Shrine in Aomori.
. - Genta and the Kappa 源太様 と河童 - .
. Matsubara Kappa Sha 松原河童社 Matsubara Kappa Shrine .
. mukashibanashi 昔話 folktales - Introduction . the distinction to legends is sometimes blurred. Kappa iwa かっぱ岩 Kappa boulder, Kappa rock .